I hope you all had a wonderful Christmas holiday, and now as we are about to say good-bye to another year I would like to take this opportunity to Thank You for your business throughout the year and I look forward to what the new year has in store for us all. It has been my pleasure bringing you these newsletters each week and I have enjoyed hearing back from you. I'd like to give a specail THANK YOU to Jerry Maxwell and Bob Nichols, I could always count on you both when I asked for people to share stories or experiences. In my previous newsletter I asked for you to share your favorite holiday memory, and I have a couple of great for you. Tami Thanks for the acknowledgement. Ha I liked your Christmas memory. Made me chuckle. I don't really have one except that my wife has many cutesy snow men that line the entry sidewalk to my house. I'm the gardener and have to move them to mow the lawn then replace them in the designated spot. Next lawn mow day they are going back in the box. Shared memories are always fun. The opening weekend of Disneyland and my aunt and uncle took my sister and I for our first trip to the wonderland. We were in line for the big Mississippi riverboat and we were selected to go to the Captains steering room on top of the boat. My sister and I both got a chance to "steer" the riverboat and we both received a certificate of riverboat operator, I still have mine. We thought we were really something after that experience. 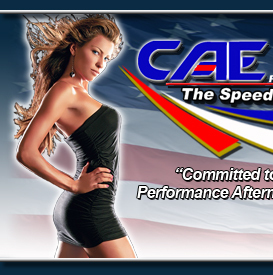 If you know of someone who would like to start recieving my weekly newsletter thry can go to our website at www.caeperformance.com and fill out the "subscribe" box on the HOME page. You can also follow us on our FACEBOOK fan page, just click the icon on our website HOME page. I just got some great pics and an awesome video from our friend Steve McCumber in Australia of his daughter Mariahs race truck...check her final run. I'd like to end this year with a "save-the-date" for you in Januray 2013. The car show season kicks off in a big way over the weekend of January 25-27 with the 64th Annual Grand National Roadster Show at the Pomona Fairplex. I will have more details on this event in January.